I just happened upon a well-researched article posted to Boing Boing. Titled Ghost Babies, by Mark Dery, the post delves into the re-sale of postmortem photographs for sale on eBay and elsewhere with a little history on postmortem photography in 19th century America thrown in for good measure. As a librarian, I found the sources to be a nice cross-section to begin further investigation. Here are the works mentioned and a brief description. These are of course but a few monographs on the subject of memorial/postmortem photography. Check your local public or academic library or interlibrary loan resource to delve further. Secure the Shadow: Death and Photography in America. Jay Ruby. Secure the Shadow is an original contribution that lies at the intersection of cultural anthropology and visual analysis, a field that Jay Ruby’s previous writings have helped to define. It explores the photographic representation of death in the United States from 1840 to the present, focusing on the ways in which people have taken and used photographs of deceased loved ones and their funerals to mitigate the finality of death. 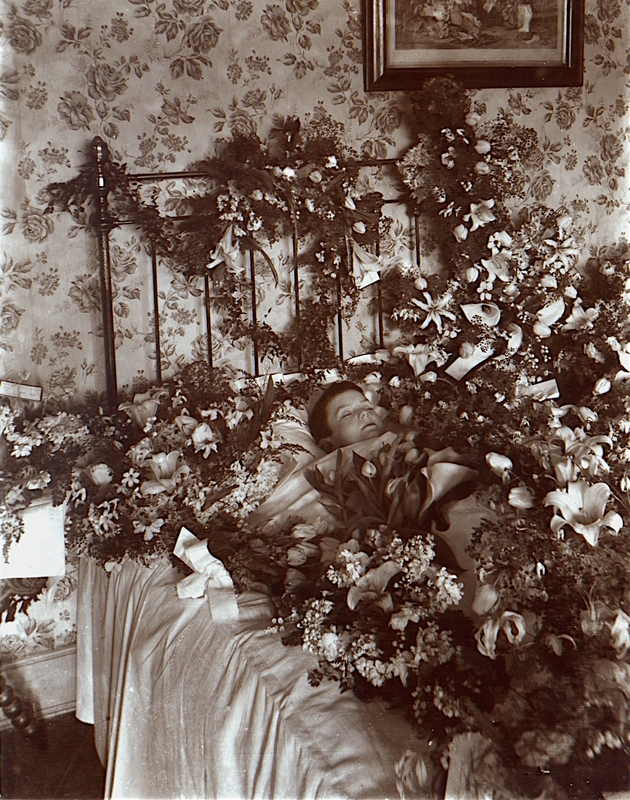 Sometimes thought to be a bizarre Victorian custom, photographing corpses has been and continues to be an important, if not recognized, occurrence in American life. It is a photographic activity, like the erotica produced in middle-class homes by married couples, that many privately practice but seldom circulate outside the trusted circle of close friends and relatives. Along with tombstones, funeral cards, and other images of death, these photographs represent one way in which Americans have attempted to secure their shadows. Sleeping Beauty: Memorial Photography in America. Stanley Burns. Postmortem photography, photographing a deceased person, was a common practice in the nineteenth and early twentieth centuries. These photographs were often the only ones ever taken of their subjects and much pride and artistry went into them. It is astounding that although postmortem photographs make up the largest group of nineteenth-century American genre photographs, they are largely unseen, and unknown. Today we struggle to avoid the topic of death; as a result we have closed the door on these images, which reflect an American culture in which death and mourning played a visible and active part. These photographs were a common aspect of American culture, a part of the mourning and memorialization process. Surviving families were proud of these images and hung them in their homes, sent copies to friends and relatives, wore them as lockets, or carried them as pocket mirrors. Nineteenth-century Americans knew how to respond to these images. Today there is no culturally normative response to postmortem photographs. Discussions of death in books are prolific, and we are accustomed to images of death as part of our daily news; but actual death, as a part of private lives, has become a shameful and unspoken subject. The Victorian Celebration of Death. James Stevens Curl. Wisconsin Death Trip. Michael Lesy. A Traffic of Dead Bodies: Anatomy and Embodied Social Identity in 19th-Century America. Michael Sappol. Posted by Kim in Grief + Mourning, Monuments + Memorials and tagged postmortem photography. Bookmark the permalink. Lots to get the teeth in to here. Thanks. Great. What was the calamity which carried off the family in the photo? Not sure of the calamity that befell this family. The image is from Sleeping Beauty: Memorial Photography in America, by Stanley B. Burns, c. 1990. The book is rare and out of print and sells for hundreds of dollars online. According to WorldCat (a database of library holdings worldwide), there are approximately 368 libraries that own it. If you really want to pursue it, you might want to investigate borrowing it via interlibrary loan if you can. The family in the picture were Carney Parsons, his wife Minnie and sons Jesse, Fredrick and Edward from Licking, Missouri. They were murdered in 1906 by their neighbour, a man called Jodie Hamilton, google the names, there are several sites with the full story.